In 2013, there were about 70,000 battery electric vehicles (EVs) and 104,000 plug-in hybrid electric vehicles (PHEVs)—small numbers compared to around 226 million registered vehicles in the United States. Total U.S. sales of plug-in electric vehicles (PEVs) have increased in recent years, but still represent only about 0.7% of new vehicle sales in 2014 so far, up from 0.6% in 2013 and 0.4% in 2012. 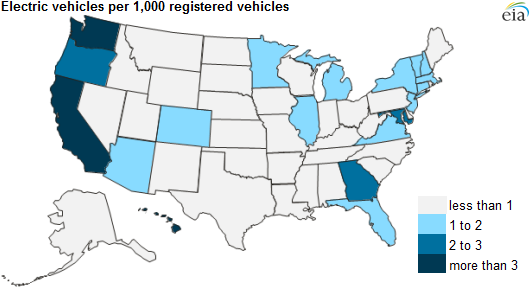 California is home to almost half of all of the nation's PEVs, but even in California, only about 5 out of every 1,000 registered vehicles are PEVs.